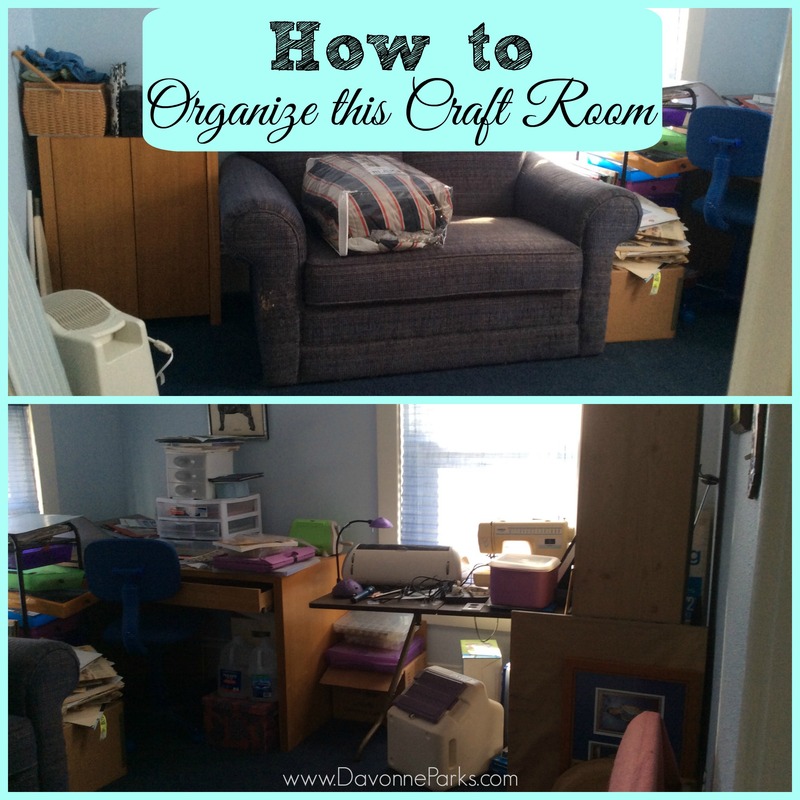 Today’s messy situation was submitted by Christine and I’m going to tell her how organize her craft and TV room! Christine, thanks so much for e-mailing your photos and questions – I’d love to help you out! We’re going to break this down into a few sessions to make this feel more manageable for you. I have bad news for you – you’re going to have to get brave and brace yourself before you walk into your craft room because there will be no more turning around and leaving! The good news? You don’t even have to start cleaning during your first session. You need a game plan, so before you even start organizing, go ahead and envision how you want your space to look. Do you want to keep the furniture laid out how you currently have it or can you do a little rearranging? Don’t just do something because that’s what you’ve always done – really think about configurations that would work for your family. I personally think it would look nice if you want to put your new chair at an angle in the corner of the room (a little to the left of where the couch currently is). You may also want to consider either moving your desk in front of your window or putting cubbies above the desk to hold craft supplies.. While you’re thinking about furniture placement, also think about creating little areas or zones for your items. For example, if you have any important documents or business supplies in your craft room, those should be put on a shelf or in a bin together, so they’re easy to access but out of your way. Also consider the craft supplies that you have and think about how often you’ll use them as well as where you’ll use them. Will you sit on the chair to knit while you watch a movie? If so, you’ll know that you want to fill a little basket with knitting supplies and put it next to your chair! And, unless you have a really great reason for keeping two desks, I think you should also consider getting rid of one of them – having too much surface space is like practically begging for clutter piles to accumulate! Lastly, think about the artwork you have leaning against a shelf. Do you love it and will you hang it up soon? If not, then donate it. Again, don’t actually do anything yet – just breathe, dream, and envision. Once you’ve thoroughly completed these suggestions, session one is over! Go take a break! Start small. Clean out one pile, one corner, or one shelf. Don’t pull everything in your room out at the same time because you want your space to look better, not worse, as you declutter! Purge! If you haven’t used something in a year, then you probably won’t use it at all. Laura has a fantastic post with great tips about how to decide which craft supplies to keep and which ones to donate, so make sure to read her article! Tame any paper clutter. Read this article for tips about how to do that without feeling too overwhelmed. Corral like items. Pens with pens, fabric with fabric, etc. Rethink your current systems. Maybe you currently keep fabric in a drawer but you think it might be better on a shelf – try that out and see how it looks! Rearrange your furniture. Remember that if you don’t like where you put something, you can put it back and nobody will ever have to know! 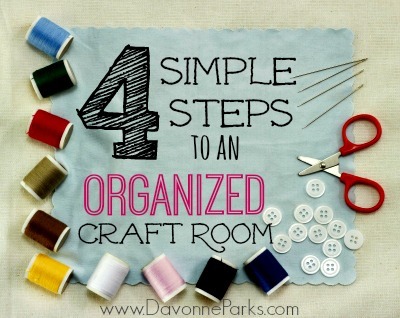 You can start making your craft room beautiful by hanging your existing artwork on the walls. I also recommend checking out Dani’s post about office organization because she’s amazing at decorating and has some fabulous ideas that are frugal, simple, and beautiful! If you’d like to see even more specific ways to break down declutter sessions, check out this office mess sos post! I hope this helped you Christine – don’t forget to send after photos so you can receive your gift card! I can’t wait to see your organized space! PS If you submit your own mess by October 30th, you’ll receive a free copy of Chaos to Clutter-Free, plus you’ll be entered into a drawing to win a $50 Amazon Gift Card! Details and submission information are here. « A Reader’s Laundry Success! Thank you so much! It certainly helps to have a plan! You are so welcome, Christine! I’m glad this was helpful to you!